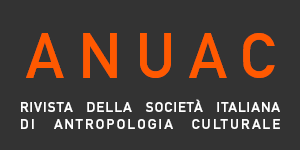 Anuac, originally the journal of ANUAC (Associazione Nazionale Universitaria Antropologi Culturali), was establisehd in 2012 at the initiative of Luisa Faldini (University of Genoa) who took over the Editor-in-chief role during a three-year term (2012-2014), publishing the first three volumes (all of which are currently available in the Archives section of this website). Luisa Faldini editorship was assisted by an Editorial team based at the University of Genoa formed by Bruno Barba (Managing Editor), Maria Elena Buslacchi, Alberto Castaldini (Deputy Editor), Alessandra Guigoni, and Eliana Pili. On January 2015 Filippo Zerilli (University of Cagliari) was appointed Editor-in-chief of Anuac supported by a new Editorial team based at the University of Cagliari, and a renewed international Advisory Editorial Board.